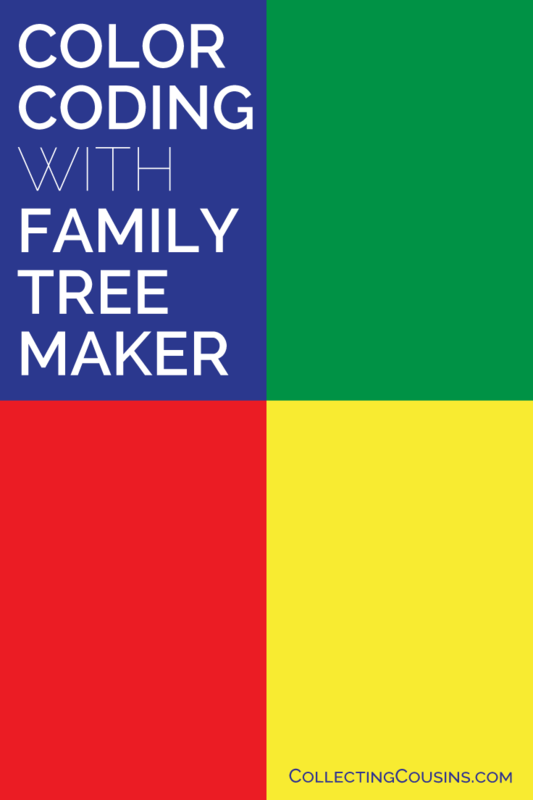 After a long wait and lots of hard work by Jack Minsky and the team at MacKiev, Family Tree Maker 2017 for Windows and Mac has been released. One of the features I was most excited about is the color coding that is available in both versions. In my notebooks I keep additional binders (such as the white Dupuis/Dupuy binder in the photo above) for current research for a specific line. 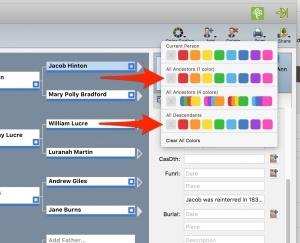 One of the new features in the recently released 2017 version of Family Tree Maker is the ability to color code your ancestor’s profiles. 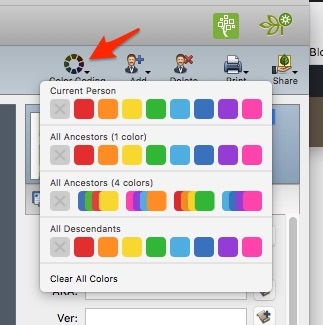 These colors will not sync with trees on Ancestry, but they are very useful for quick visual identification inside of Family Tree Maker. To the left is an example of the color coding on the tree view – you’ll notice that the home person has all four colors, and the home person’s parents have the two colors each from their parents. Along with the colors used above in Mary Hill’s system, additional colors are also available. The potential uses of these range from adding a specific color for individuals in your direct line, people who served in the military, immigrant ancestors, DNA matches, and more. 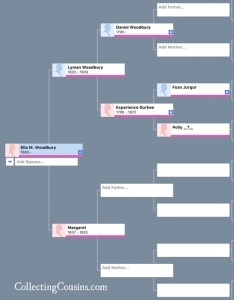 The blue squares indicate matches to FamilySearch trees, but I will probably turn those off until they indicate matches to FamilySearch records. Occasionally I find an individual in a tree with relevant records and/or sources attached, but so far most of those matches lead me to individuals with no sourcing. I often create “island” groups of individuals who are ancillary to my ancestors (potential relatives with no proven link, individuals in their FAN, etc.) but not connected to the main tree. These individuals are in the tree file but are not related to the home person, so I color these individuals pink (for groups that are probably relations) and purple (for unrelated individuals in an individual’s FAN). Using this system, I can glance at my list of individuals and have a quick visual reference as to their place in the big picture. I’ve finished color coding my tree and am now resolving all of the place names that I have ignored for years. It will be nice to finally have those in a nice hierarchical structure under the Places tab. Are you using the new color coding feature? Let me know in the comments what you use the colors to indicate in your tree(s). 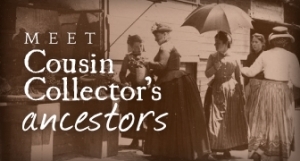 Collecting Cousins may be compensated for any of the links in this post through sponsorships, paid ads, free or discounted products, or affiliate links. All Amazon.com links are affiliate links. I like your idea about using colours to mark unrelated people. I have two quite large groups in my tree who MIGHT be related to me, but my link to them is so far unproven. Right now though, I’ve used up all the available colours – four for my ancestral lines, and the other four to mark people in military service – WW1, WW2 and the Revolutionary War – patriots and UELs. I wish there were more colours! Maybe FTM will add more at some stage, but meanwhile, I think I’ll undo my WW1 and WW2 coding and use those colours for my ‘maybe’ ancestors instead. As much as I love the color coding idea in FTM 2017, I wish there was a way to one click the Paternal and Maternal lines so that all members on each line are color coded instantly in one action. Is there a way? I have been individually coding and it is quite time consuming. That is how I did my color coding and it went a lot faster. I went to each grandparent of the home person and choose All Ancestors with the appropriate color, then later I went up the line to the furthest back person for each line and did the same thing with all descendants to make sure I had all of the siblings for each generation. That left some stragglers, but at that point it was just a matter of going through the index and viewing the individuals without colors (usually spouses or island groups) and hand coloring them. I only have about 1800 people in my tree and had it done in a couple of hours. Thank you Mary! I just started using this program today (had 2014 version) and this saved me so much time! Glad it was helpful, Melissa! Hi Mary! I’m confused on how you are suggesting to do it. I went to each of my grandparents and chose 1 color, all ancestors. That worked fine. But what exactly is your next step? So you would go to great grandparent and do what? Sorry for my confusion. Also, How do I apply two colors to my parents and then all four colors to myself? When I click on myself and try to choose four colors on the current person it keeps replacing the previous color. Hi Bob – You have to use the “all descendants” choice on the ancestors in order to get more than one color for the home person. In my reply to Tom above, I describe how I was able to do that and included a screenshot showing where to select that option. Hope that helps. Thanks Mary. That method is just brilliant and took very little time. I am now left with the stragglers to hand color which will be done over time. I already had color coding for Military and Naval so I have devised a color chart for handy reference as you can be easily fazed when not in daily contact with FTM. Having completed color coding of all direct family lines I now have 4 colors for myself, 2 colors for my parents and then 1 color for each of my grandparents. The colors now extend all the way up to the end of the line and then back again through the descendants. As there are so few colors on offer, I would be interested to know how you tackled which color to use on all the spouses and their extended families. 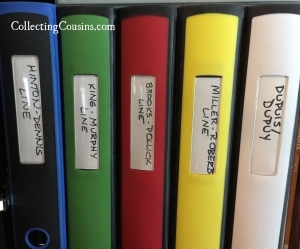 I am inclined to color them the same as the line they married into so that when you scroll down through the index you know that all those unfamiliar names are indeed part of your ancestral line. 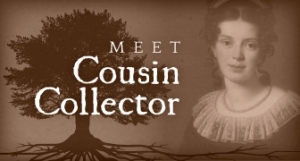 I have had messages from Family Tree sites about my connection to a certain person which has me scrambling to check the relationship to my ancestral line. If I color them as suggested above then it would make the task of quickly identifying them as married into to one of my ancestral lines so much easier. What are your thoughts on this? I colored all related persons the same color as the direct line for exactly the reason you gave – it’s a quick visual clue as to where they are in the tree when someone asks the relationship. If you have ever seen colorized fan chart, that is how the spouses are colored. If you haven’t read Mary Hill’s explanation of her system, I recommend doing so (the link is in the post above). It is good to be on the same page, I had not read or looked at Mary Hill’s color coding system and having done so it confirmed my intended color coding. Mary’s webinar was most instructive. So thank you again and I know your comments have been very helpful to my other genealogy friends. How does one print the color coding. While I can change the ancestors to the colors in tree view, when I go into the publish charts, no colors show up. Unfortunately the color coding appears to only be available for internal use within the program. It doesn’t sync with Ancestry, and it doesn’t appear on reports. That would certainly be a welcome feature and a request could be made to MacKiev to include the feature in future editions. Until such a time when it might be implemented, an alternative to consider is the Charting Companion by Progeny Genealogy. I am not using it because it is only for PCs and I have Macs, but it has some lovely report options. Hi, I’ve automatically added the ancestor colours and have added an additional colour for military. I wanted to do another colour for relatives who also do genealogy. But when I add the genealogy colour to someone in the military, the military colour disappears. Can you please tell me what I am doing wrong? Hi Roseanne – It seems that you can only add a color if the color that is already present was added as part of All Ancestors or All Descendants. When you have manually added a single color to an individual, selecting a second color manually replaces the previous color. I’m not sure if this is a bug or an intentional feature, but it wouldn’t hurt to let MacKiev know that it is happening and it is not the preferred behavior. It might be a simple fix that they could add to a future update. Love the colour coding, but for me there isn’t enough colours. Not when there are 15 children and only 8 colours. In the families I’m researching most have 10, 12 and 15 children. 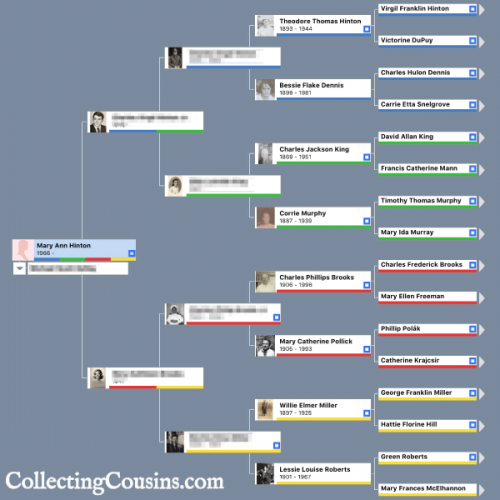 Hi Peta – Color coding for genealogy can certainly be personalized to your preferences, but the FTM system is based on Mary Hill’s 4-color system (linked above in the post). It starts with the home person and goes up the pedigree, which means there are always 4 branches to color – one of each of the home person’s grandparents. It is a quick visual way to determine which line someone is on. Not sure if this is the right forum to ask this question, but is there a way to view the tree by color? Hi Lisa – I’m not aware of a way to view the tree by color. It would be nice if we could filter by color in the index of individuals in the left panel, but that isn’t currently possible. You mention that you could use a color to indicate immigrant ancestors. I’ve done this, but find I can’t sort for these people. Am I missing something about the ability to filter for a particular color? Unfortunately there isn’t an ability to sort or filter by color – the only option is to scan for the color you set in the index of individuals. I do a Reunion and I color code per children from 1 specific relative. Each group has a color. I would love to have more color options. There were 12 children and not that many colors. Working on Reunion things this year. July 21 is that date! I also color the 1 page pdf tree I get printed at Office Depot. (I color that with colored pencils- much cheaper) I print all name tags in the corresponding color. Everyone can see what color Family your from. Been doing this 10 years now. That’s a great idea, Dawn! Is it possible to print an extended family tree with the color coding assigned to specific individuals? As I mentioned above, the color coding appears to only be available for internal use within the program. It doesn’t sync with Ancestry, and it doesn’t appear on reports. 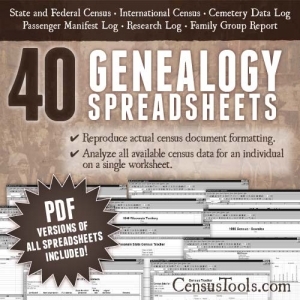 An alternative to consider is the Charting Companion by Progeny Genealogy. I am not using it because it is only for PCs and I have Macs, but it has some lovely report options. The term “printing family tree with color coding” is not the same as “printing family tree from Family Tree Maker with color coding” – there are many family tree software packages that have options that FTM does not offer, including color coding. Even if the search is done using “Family Tree Maker” in the search term, that doesn’t necessarily mean that the results will be from FTM since search engines all have different algorithms for returning results. If this is a feature you’d like to see in Family Tree Maker, I recommend letting Mackiev know through a feature request. Is there a way to print a selection of a family tree (excluding some members on a basis other than relationship)? I want to show selected members of a blended family who are living in a house together (I did want the color coding to indicate which were living on which floor, but that isn’t possible in standard FTM). Thanks. Mackiev has lots of great support documents on their website (they also offer an instruction manual that can be ordered for both Mac and Windows verions). The details for what you are asking about are available on the “Customize, Format and Save your Report in Family Tree Maker” page about 3/4 of the way down under “Individuals to Include.” Hope this helps! Mary Ann, thanks for all your responses to me and others. In fact (and even with Charting Companion), as far as I can tell it it isn’t possible to do what I am trying to do except to hand tool it myself. That is, save to PDF to some image format, open in graphic program, and erase the members I don’t want to see and color-code. Of course, this means one might has to hand tool every change also! Unless I am missing something, none of the charts have SELECTED INDIVIDUALS option, and the reports would never include the complete set (e.g., spouses of the step-sibs and their offspring). It’s interesting how traditional values are built into the ‘views’. Hmmm – it looks like that option isn’t available in the pedigree chart. I’m sorry to have misled you. I don’t usually filter individuals in that chart, so I was relying on what I have done in some of the other reports. I think a solution might be to use the export function, which allows you to filter individuals before export, to export in FTM format to create a new (temporary) database. You could then open the new filtered file and use it to create the reports you want, deleting it when you are done. I would name it something that makes it obvious it isn’t the main database you are working with on an ongoing basis. You would have to do a new export after making changes to your main database, but it sounds like this is not something you would be doing on a frequent basis once the chart is created. Ok.. I am submitting to the color coding but I am not sure.. do I start the first generation with my two year old son and then I will be researching both his Father’s lines and my lines would be red and yellow and then his fathers blue and green. and then his father all four colors? I have already started using these colors to assign to lines slightly– just with bowtie consecutive charts to lump them together. Also which program makes the Fan that is not Family Search free PDF, I want something not affiliated with a religious org for inclusivity. I have a MAC but legacy is not for MACs. I bet you have some ideas? The color fan chart is so helpful to the eyes and to clearly distinguish lines! Hi Vanessa – Whether you start with yourself or your son when you code the colors is entirely your preference, but I would definitely be consistent if you are using color coding elsewhere. I started with myself and did the four colors, and did my husband separately with the four colors, but I have separate databases for each of us. If you have one database with your son as the home person, I would suggest doing yours red and yellow and his father’s blue and green. I uploaded a gedcom to TreeSeek.com to print a fan chart with colors (it creates its own colorization based on the home person in the gedcom file; it doesn’t use the colors from FTM). They are FamilySearch certified (you’ll see this on many sites – it means that the site they can access FamilySearch data from the site through the API, similar to the way websites can interface with Facebook and display content but are not affiliated with FB) but I don’t think they are affiliated with them. I recently had to go to a backup after a failed sync. All of the color coding was gone. Any idea? Hi Terry – I don’t use the sync feature and haven’t needed to restore any backups, so I’m afraid I have no idea what might have happened. Mackiev is very responsive and I’ve heard good things about their live chat support. You might try that. I am an adoptee and am finding that I had to start out kind of winging it to make sense of it all. I am doing two separate trees. One is my Birth Family Tree which has one side for Birth Father and one for Birth Mother and the other is for my family with the normal mother and father. Anyone have any suggestions or perhaps a forum just for adoptees. Life is far more complicated for us on the Family Trees. Hi Kevin – I am not aware of any special forums for adoptees for working with family trees specifically, but there are several Facebook groups with wonderful volunteers helping adoptees using DNA in their searches (do a search in Facebook on the term”dna adoptee” without quotes to see the many results). DNA Detectives is run by CeCe Moore who has done great work with DNA problems and solutions. The group is “focused on using DNA to find biological family for adoptees, foundlings, donor-conceived individuals, unknown paternity and all other types of unknown parentage cases – recent and more distant.” CeCe makes recommendations for which DNA tests are the most useful for adoptees here. She also recommends the DNAAdoption blog, which has a guide for beginners that may be helpful to you. Best wishes with your search – I see adoptees who have found their birth families posting regularly, so try not to get discouraged. You never know when that connection might pop up that solves a big piece of the puzzle. Hi Diane – Click the Color Coding box for the individual. You can only clear the colors the same way you set them, so if you set the color for just that individual, you can clear it by clicking the X in the gray box under Current Person. If you set the colors by coding all descendants of an individual, you would need to clear the color on descendants by clearing it on the same person you set it on. You can clear all colors for the entire database of individuals using Clear All Colors. I followed your directions for using blue, green, red & yellow for my grandparents. But, no colors showed up for my parents or for me. I thought I would see blue & green for my dad & red & yellow for my mother; and then all 4 colors would come up for me. What else do I have to do? Hi Judy – When you choose the colors for your grandparents and their ancestors, it will only do ancestors. To get the descendants and make sure they have all of the correct colors, you have to go to the end of each line and do the same process, but choose descendants instead of ancestors from the color options. That should make sure that all siblings not in the direct line of each of your grandparents are color coded properly, and that the colors also apply to you and your parents. This looks like a great method of sorting and a quick visual! Let’s hope it gets on the sync with ancestry.com soon. I have been wanting to identify quickly and visually where – country/state people are born. Never found a way to add it to the visual tree, maybe a color coding option? I think it would tell a great story and establish patterns and migrations. It would be great if it would sync to Ancestry, but I’m not holding my breath. Changes usually flow from Ancestry to their development partners rather than the other way around. I like the idea of using colors for location, Joyce. I uses Places in FTM but find it cumbersome–color coding would be a great visual aid. Another great use would be for DNA matches and/or ancestors through whom you have confirmed matches. So many possibilities with the color coding! I use color coding for a completely different purpose. I’m working on my Mayflower ancestry, and have included all my Mayflower ancestors in my family tree. I use the colors by going to each Mayflower ancestor I am tracking, and use the All Descendants row and select a color for each ancestor. That way, I can scroll through my index and see everyone who is descended from each Mayflower passenger. Since I descend from several Mayflower passengers, there are 7 color bars on my individual line item. I can mouse-over each color, and it shows the name of the passenger, and number of descendants connected to that passenger. That’s a great use of the colors, Lee.